"Mihai Vodă" redirects here. For the prince after whom the village is named, see Michael the Brave. For the monastery with this name, see Mihai Vodă Monastery. 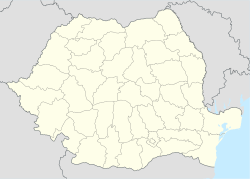 Bolintin-Deal is a commune located in Giurgiu County, Romania. It is composed of two villages, Bolintin-Deal and Mihai Vodă. At the 2011 census, 99.5% of inhabitants were Romanians and 0.4% Roma; the latter formed a higher percentage of the population before being driven away during ethnic clashes in 1991. This Giurgiu County location article is a stub. You can help Wikipedia by expanding it. This page was last edited on 13 March 2017, at 21:09 (UTC).